In our new series “In the News,” we take a moment to look at a headline issue and reflect on how it impacts the neighborhoods where we live and work. Michael Kimmelman’s July 15 New York Times article “Renewal Projects, Down to the Sidewalks, Highlight Social Divides” draws a stark connection between recent police violence and the more insidious racist influence of Twentieth-century planning policy. In each of these deaths – Eric Garner’s on the neglected North Shore of State Island, Akai Gurley’s in a Renewal-era housing complex, Tamir Rice’s in a Cleveland public park, and Trayvon Martin’s in a Florida gated community – the built landscape was not just a stage set but a headlining player in the tragedy of these lives cut short. As Kimmelman asserts, Garner’s death highlights an important struggle over equality in public spaces, a struggle that has echoed throughout the civil rights movement. The right to safe, welcoming public spaces – parks, streets, sidewalks, and squares – is fundamental in every community. The systemic destruction and degradation of these spaces through demolition, bad design, neglect, or threat of violence is an infringement on this right, and communities of color continue to bear the brunt. We can add another item to the list of malignant urban design decisions: Streets built for cars, which are frequently deadly for those of us who, by choice or necessity, move through our city on foot or bicycle. And what would seem to be an equal-opportunity killer – car “accidents” should be random by definition – is not at all. Last year, Smart Growth America published its report Dangerous by Design, with the finding that pedestrian deaths nationally, about 5,000 a year, are 60% more likely to be of an African American victim than a non-Hispanic white person, and 43% more likely to be Hispanic of any race. More than 80% of all pedestrian deaths across the US occur when cars are moving faster than 35 mph. So in less dense cities, it’s not surprising that 40% of all pedestrian deaths occur where there is no crosswalk. * In these places, usually sprawling metropolitan areas, there is a serious structural inequality at play. People don’t cross or travel along high-speed roads on foot or by bike by choice – but they do by necessity. Those who walk or bike on roads designed for traffic are people who cannot afford to do otherwise. And in our country, those are low-income people of color. On top of the increased threat African American and Hispanic people face regarding vehicle-on-pedestrian “accidents,” there is old-fashioned racial discrimination to contend with. A study by the Oregon Transportation Research and Education Consortium found that drivers are less likely to yield to black pedestrians waiting to use a crosswalk than white ones. Pedestrians of color are discriminated against even when they are using public streets and crosswalks in the “right” way. And traffic deaths are not the only hazard when car-centric urban landscapes combine with ingrained racial prejudice.When Trayvon Martin was shot he was walking in an area designed for driving, a behavior that George Zimmerman found suspicious. And in Ferguson, Missouri, a very common arrest is for “manner of walking along roadway.” This intentionally vague law encourages police suspicion of pedestrians and allows police to follow someone without a real reason. Not surprisingly, African-Americans comprise 95% of these arrests. Streets and sidewalks are by far our largest public spaces, typically making up more than 25% of our cities, while parkland hovers around 2%. In many communities, these de-facto public spaces, designed for cars, are ill-equipped to meet the public need for foot and bicycle transportation, recreation, social interaction, political demonstration, and more. They are mismatched to our most basic human needs, and communities of color suffer disproportionately from this mismatch. Beyond being merely unpleasant, our streets are fundamentally unsafe, upholding a legacy of systemic discrimination that, in a flash, can become all too apparent. 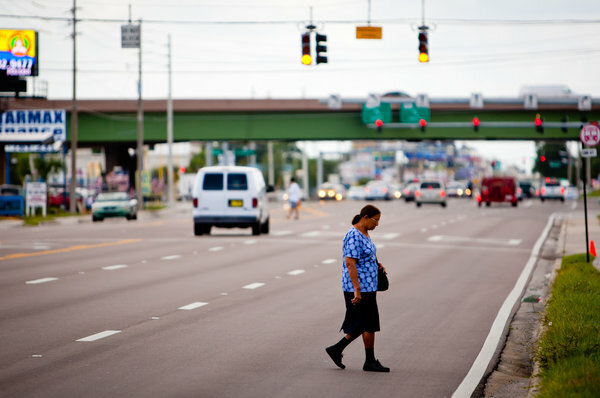 *Florida is a particular offender: The four most dangerous cities for pedestrians as ranked by the Pedestrian Danger Index are Orlando, Tampa, Jacksonville, and Miami-Fort Lauderdale.